People always ask me what I ate in Alaska. In summer, it was Arctic grayling and berries. This winter, it was meat, meat, and more meat. I came face to face with this fact on our first day in the bush. My dad and I had brought in provisions, and Heimo and I were transporting them back to the cabin. Heimo was driving the snowmachine (in Alaska, it’s called a snowmachine or a snow-go) and pulling me in a sled. As we were hurtled down the path, I turned to catch a glimpse of the cabin, and almost collided with the giant foreleg of a moose. 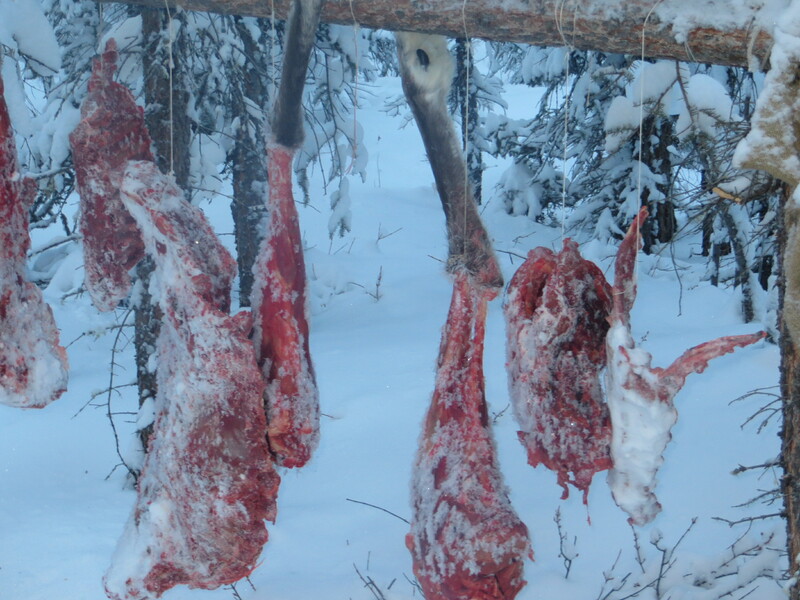 Next to the foreleg was a frozen slab of mountain goat hanging from the meat rack, two shoulders, a mid-section and foreleg of something I couldn’t quite identify, and a caribou head sitting on top of the woodpile. 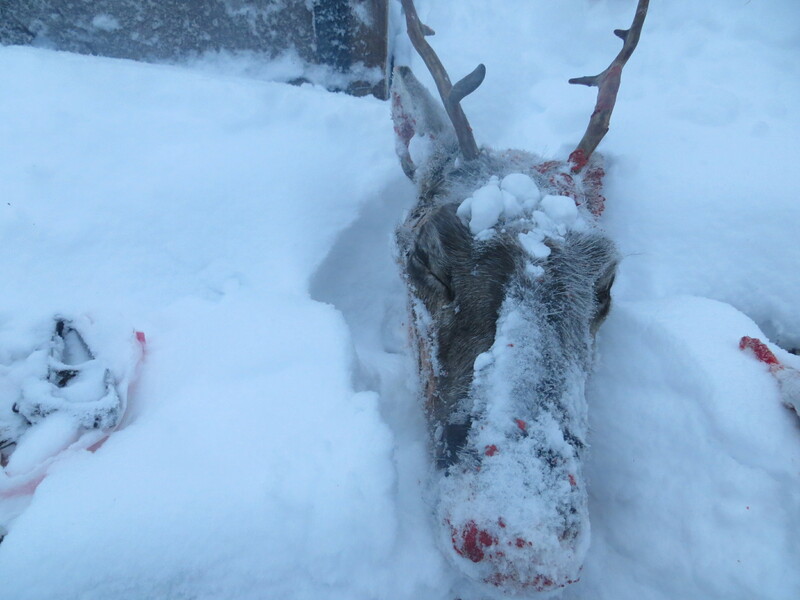 I didn’t know it yet, but that meat represented the Korths’ winter food supply and our supper for the next three weeks. We’d brought in fresh fruit and veggies, but they lasted no longer than it took to burn an armful of logs in the woodstove. Heimo went through the lettuce like a binging brontosaurus. Acquiring enough meat to last the winter is a major preoccupation for the Korths. They are always on the lookout for a wandering caribou or moose. But with enough meat hanging from the meat rack to last them until February, Heimo could afford to be picky. I was happy to eat almost anything. But brains and tongue? That’s where I drew the line. So I was grateful, when we headed back to the cabin empty handed. I, too, caught the scent. It made my mouth water. Thirty minutes later, Edna flopped a drumstick down on my plate. I went at it like a wolf to a caribou carcass, eating rib style, with a napkin bib, and a whole lotta smackin’ and finger lickin’. It was as delicious as Heimo said. Over the course of next few weeks, I ate things I never thought I’d touch — seal, fish eyes, mountain goat, caribou organs (kidney, liver, and heart, my favorite), fat, gristle, and marrow. And, only once did my taste buds rebel. On my Dad’s birthday, Edna prepared fried beaver tail. As I watched Heimo work on a marten fur, I could hear the beaver tail sizzling and popping in the frying pan. My dad had warned me that it would be the richest, fattiest food I had ever eaten. Twenty minutes later, I learned that he wasn’t kidding. It tasted like congealed bacon grease; it was the quadruple Big Mac of the bush. After just a few bites, my stomach felt as if I’d swallowed a can of Crisco, and I was feeling woozy.